In October 1873, the Harvard University Football Club was invited to join the Intercollegiate Football Association, which was then being formed by Yale, together with Rutgers, Princeton and Columbia. All of the teams except Harvard played a rough version of soccer, which they called “football”. In a decision which, in retrospect, was perhaps the most momentous in the history of American football, Harvard brusquely turned down Yale’s invitation in deference to their own, recently developed brand of rugby called the “Boston Game”. A few months later, Harvard accepted a challenge from Canada’s McGill University rugby team. 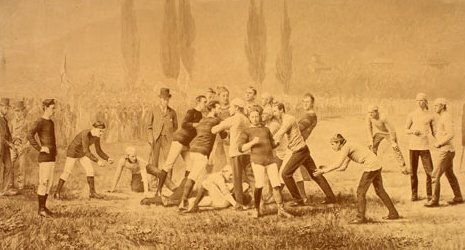 It was agreed that two games would be played in Cambridge on May 14 and 15, 1874: one to be played under Harvard rules, another under the stricter rugby regulations of McGill. It was this two-day tournament, played on Harvard’s Jarvis baseball field at a total cost of $2.50 to the Harvard Football Club, which proved to be the genesis of Harvard, and, coincidentally, American football as we know it today. Some five hundred spectators, mostly students, paid fifty cents apiece to watch the teams play under “Boston” rules on May 14. The kicking of a round ball was the “Boston Game’s” most prominent feature. A player being pursued could run with the ball, pass it, or dribble it (known as “babying”). The man with the ball could be tackled, too. Hitting, tripping, “hacking” (shin-kicking) and other unnecessary roughness was prohibited. Any number could play, but there were typically ten to fifteen on a side. The Canadians were beaten handily on that fateful May 14th, as the Crimson easily defeated a McGill squad which displayed a woeful lack of experience and knowledge concerning the Boston rules which had been in use for years at preparatory schools like Boston Latin, Andover and Exeter, and on the vacant lots of the Back Bay. Harvard even managed to hold McGill to a 0-0 draw at McGill’s own game on the next day; and when Harvard played a return match in Montreal that fall, conversion was in the wind. Harvard, which had spurned Yale’s invitation to join a soccer federation, cast its allegiance with the more “Boston-like” rugby regulations of the Canadians, and the amalgamate which was forged, as adopted by the newly formed Intercollegiate Football Association in 1876, became the foundation of modern football. In the decade that followed, the modified rugby rules which had been the basis of the I.F.A. were altered as elements of rugby were dropped, and further rule changes shaped the new game, which, through evolution, became American football, with many basic rugby characteristics remaining to this day. It is today, May 14th, then, that we celebrate the completion of the first 100 years of American “football”, as opposed to the 1969 centennial celebration of American “Soccer”. A celebration which was made possible, finally, by Harvard’s adherence to their own game and its rules; and Crimson determination, in the face of Eli temptation, to pick the ball off the ground and run with it against McGill, a hundred years ago today.